This example shows how you can use the PARTITION statement and other options to control the effect selection process. The data for this example come from a study by McDonald and Schwing (1973). The data set contains 60 observations, 15 covariates, and one response variable. The response variable is the total age-adjusted mortality rate for Standard Metropolitan Statistical Areas in 1959–1961. The following statements fit a median model for mortality rate conditional on a set of climate, demographic, and pollution covariates by using the forward selection method. Because linear terms alone might not be sufficient to fit this model, quadratic terms are also added in the MODEL statement. The FRACTION option of the PARTITION statement requests that 30% of the observations be used for validation and the remaining 70% of the observations for training. The HIER=SINGLE option in the MODEL statement forces the effect selection process to ignore quadratic effect candidates if their corresponding main effects are not in the model. The OUTPUT statement creates a SAS data set named OutData, which contains the variable _ROLE_. This variable shows the role of each observation that the PARTITION statement assigns. size65="Size of Population older than 65"
nph="Number of Members per Household"
nsch25="Number of Years of Schooling for Persons over 25"
nfek="Number of Households with fully Equipped Kitchens"
snwp="Size of the Nonwhite Population"
nin3k="Number of Families with an Income less than $3000"
Output 96.3.1 shows the selection summary. 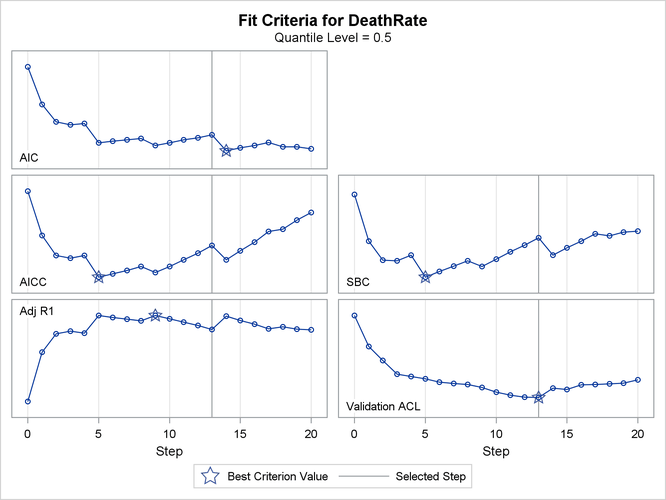 You can see that the best model is at step 13 for validation ACL, step 5 for the SBC, and step 14 for the AIC. Output 96.3.2 shows the selected effects and the relevant estimates. Output 96.3.3 shows the progression of the standardized parameter estimates as the selection process proceeds. 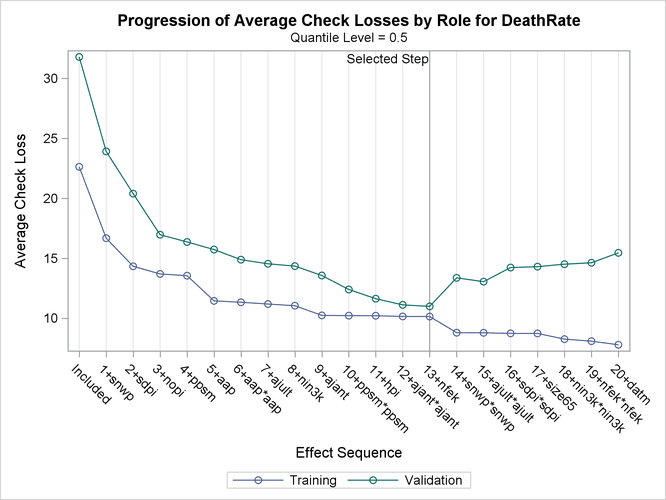 Output 96.3.4 shows the progression of the average check losses for training data and validation data as the selection process proceeds. 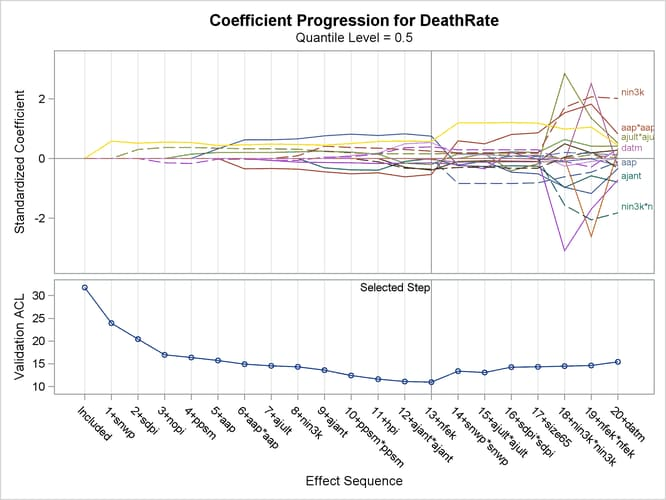 Output 96.3.5 shows the progression of five effect selection criteria as the selection process proceeds. Output 96.3.6 shows the first 10 observations of the OUTPUT data set.